When you grow up with a mom who has a shopping addiction and a mild case of hoarding you develop a skewed perception of stuff. My mom was one of the most generous people I knew. She definitely spoiled us, but at the same time, stuff started to take over our lives. As a mom myself now, I want to get my children things they want, but at the same time I don’t want a massive amount of toys cluttering up the house. I’ve found that experience gifts are a perfect solution. My daughter has been asking to attend gymnastics classes for the last two years, but it just hasn’t been in our budget. So for her birthday I prepaid for six weeks of classes and presented her with a card explaining her gift. I also got her a leotard. It also stirred up some nostalgia for me to see her up on that balance beam. That was my favorite when I was a gymnast. Watching her felt like I was passing my legacy on to her. If you want an alternative to traditional gifts like toys, clothes, or books, here are five great reasons to give kids experience gifts. 1. Something To Look Forward To – After all the other gifts have been opened, played with a handful of times and pushed aside, an experience gift is still there, promising something fun and exciting is still waiting for them. One of my favorite gifts my mother gave me when I was in high school was tickets to see Les Miserables in New York City. I had been listening to the soundtrack CD for months and when I finally got to see the play, it was amazing! I didn’t mind that I had to wait a few weeks for the play. If anything it felt like it extended my birthday. 2. Less Clutter – As I mentioned before, I really don’t like too many toys hanging around, especially when they aren’t being played with very often. Experience gifts like a special trip, art, dance or gymnastics classes won’t contribute to the clutter in your house. 3. Give Something That You Normally Couldn’t Afford– So many extracurricular activities are expensive. They certainly don’t fit into our tight budget, so we’ve had to be very selective about which activities my kids do. Since I would normally spend money on birthday presents, I was able to use that money to give my daughter something I normally couldn’t afford. 4. More Memories – How many of your toys do you really remember from your childhood? Maybe a handful if you’re lucky. No matter how much our children beg us for toys, they typically don’t occupy our children for long. Giving an experience gift gives children memories that will last them a lifetime. 5. Quality Time – Experience gifts usually give parents or other family members quality time with the children. Whether it’s a trip to the zoo, an art class you take together or just watching them twirl around the floor at their dance class, what the giver receives is time. Time to watch your child really enjoying something, seeing them light up with excitement. Sure, maybe it’s hard to run them to classes on a weekly basis or to and from their favorite sport, but it’s also time that you get to spend with them. Years from now, they’ll remember that you were there with them. Even if you were just in the background watching from the bleachers or sitting silently in the corner of the room, you’ll become part of those happy memories. I can’t for the life of me tell you what badges I earned when I was in Girl Scouts, but I’ll never forget that my mom volunteered to be my troop leader. While it wasn’t a birthday or Christmas gift, her willingness to give me and the other girls her time every week is something I still think about proudly. I would love to ditch a lot of my kids’ physical presents in favor of experience gifts. I’m not sure if I’ll be able to get my husband on board for Christmas, but at least for birthdays it’s become a great alternative. What experience gifts have you given your kids that they loved? Illustration credit to Robert Geronimo as published in Little Maia’s Coral City Adventure. 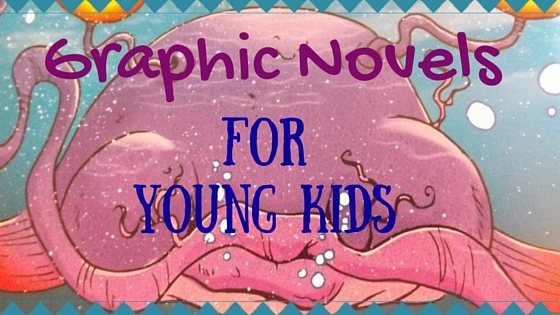 Does your kid get excited about comic books? My girls fell in love with comic books at age three. Mr. Whatever Mom is a self-professed comic book “geek.” Other than the most recognizable superheroes like Superman, Wonder Woman and Spider-Man, I really don’t know much about comics. I enjoy them as an art form, but I never developed a passion for comic books like my husband’s. For him, sharing that passion with his kids is really something special. My girls are almost five now, so we are often hunting for age appropriate (non-violent, appropriately-dressed females) comic books. Enter Little Maia. We first met Maia and her author Robert Geronimo at the New York City Comic Convention a few short weeks ago. Among all the big marketing booths and retail vendors sat Robert and his team from Ascalon Press with these amazing books about Little Maia. Maia is a little girl who takes on big adventures. 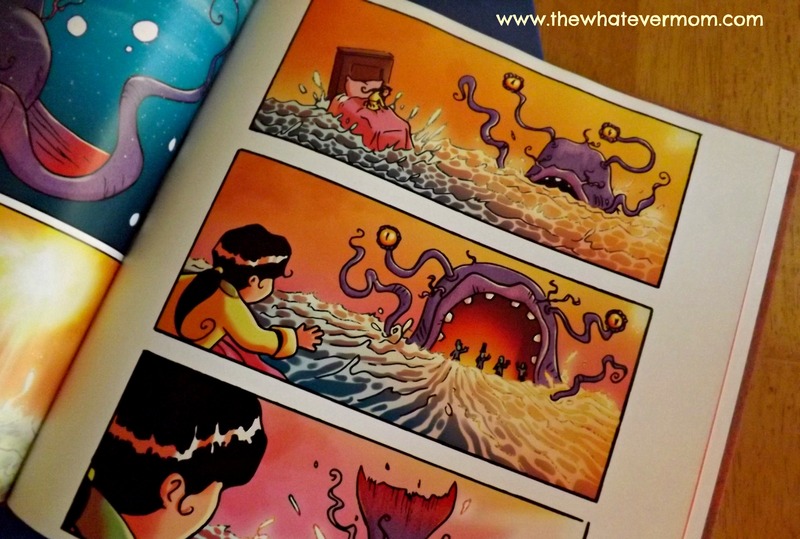 In her first adventure “Little Maia and the Coral City” she is swallowed by a large sea monster and finds Coral City, a world below the sea. Then she takes an adventure on the Lunar Express in “Little Maia and the Lunar Express” and travels through space. (Coincidentally the sea and outer space just happen to be two of our favorite topics). Both books are so beautifully illustrated you don’t even need words to tell the story. This is perfect since these are picture books without words. Kids get to make up the dialogue and narrate the action at the turn of every page. Maia is a brave little problem solver who finds her own way home. She doesn’t have parents telling her what to do or saving her from her perils. She is all on her own. The fact that she isn’t a superhero with mysterious super powers and a secret identity makes her relatable for any kid, not just for girls. Kids take on the role of storyteller through these books and can really become part of the adventure. It is amazing to hear my kids create inner monologue for Maia, give her the power to be brave and make up conversations between characters. They never tell the story the same way. They embellish it more and more each time. Parents can get in on the story by asking questions that help their child delve deeper into the characters and the storyline. “How do you think Maia feels when the thunder hits?” “What do you think she is saying to those little aliens?” “What would you do if _____?” These graphic novels have become an opportunity for my kids to connect with their own ideas of bravery and at times their own emotions. It’s amazing to see how much learning is happening while reading a comic book! As a mom I feel Maia is a wonderful portrayal of a young heroine showing that even girls take on monsters and travel through space. 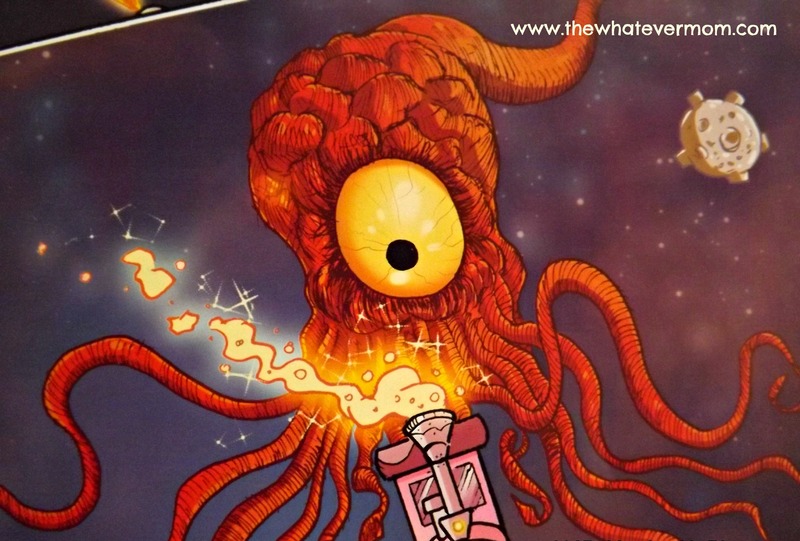 As a newly-minted comic fan I really enjoy the intricate details of the illustrations. The pictures give the story a flow even nonreaders can follow. These are great for preschoolers, early readers and beyond! What comic books are your kids reading? 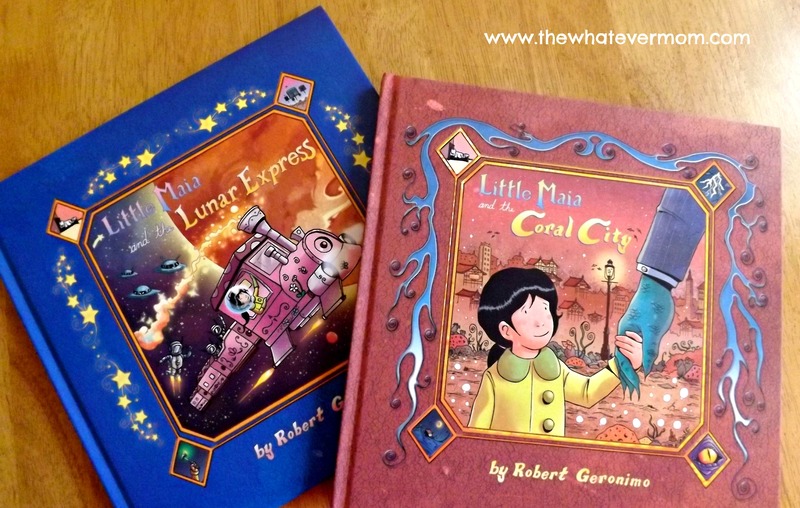 You can find Little Maia and the Coral City and Little Maia and the Lunar Express on Amazon. Great gifts for kids! To answer, no I do not officially homeschool. We do find a lot of enriching and educational activities to do in our home (and beyond). I began introducing these types of activities to my girls as a way to fill our day. They are almost five now and enjoy guiding the planning process. They definitely have some firm opinions on how things should go around here. I think kids are naturally curious, so I like to find things to get curious about with them. 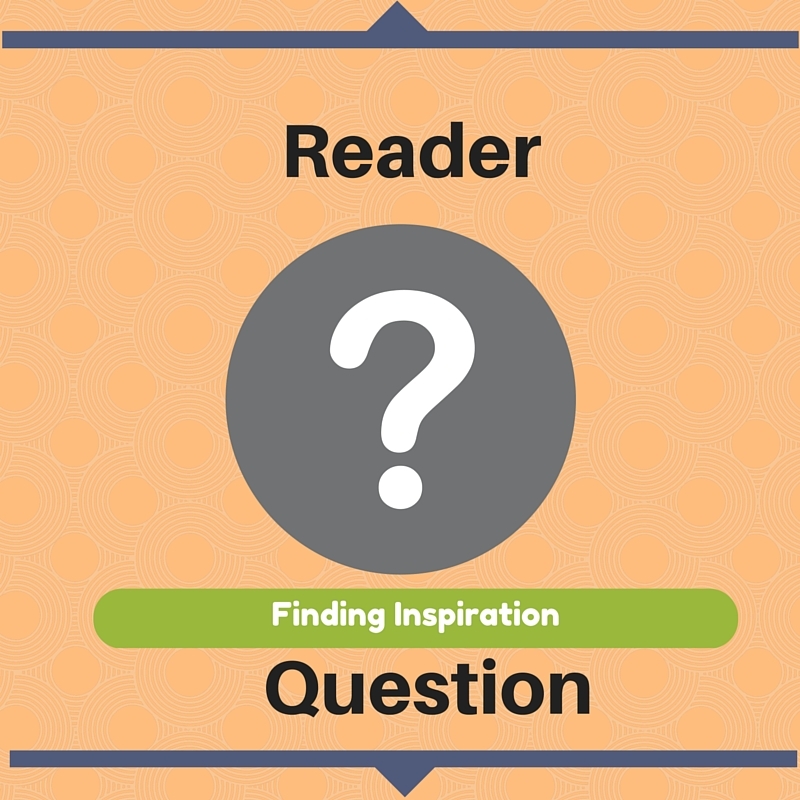 Where do I find my inspiration? I think Pinterest has a lot to offer. However, I don’t always have time to pin projects and then shop for supplies. (I usually forget about all those pins once I log out). I sometimes get overwhelmed by the sheer volume of choices. I often find inspiration for projects at our library, or in books we already have at home. I try to notice what my kids like about each book we read, which ones are they gravitating toward and what are some of the themes they enjoy. Then I try to connect those themes with another activity like a craft, or a cooking project, an experiment or drawing from imagination. 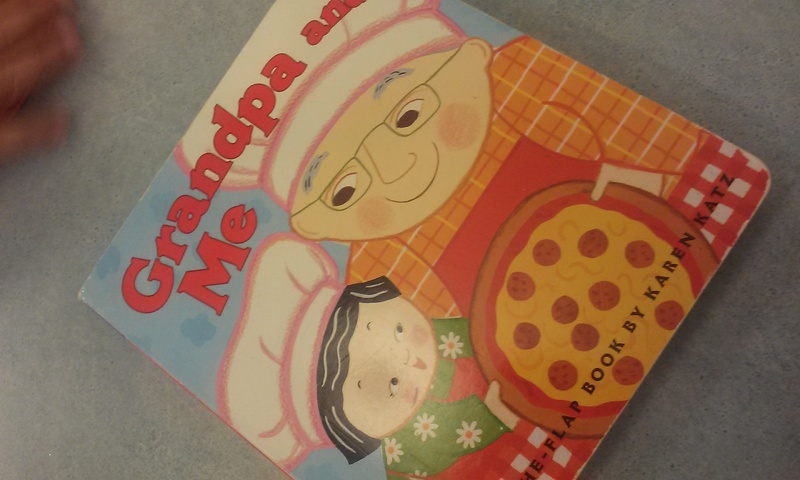 Around the time the girls were two and a half they discovered a book at the library about making pizza with grandpa. I thought, “why not make our own? !” That is how our Friday night pizza tradition began! I have such warm memories of being in the kitchen with my mother, I thought this would be a great way for us to connect and make memories too. (It is also a great way to sneak in some extra veggies under the radar. The secret is in the sauce!). Now our pizza nights include a family movie night, or girls spa night when hubby is working late. Who knew one little book could inspire so much!? So, that’s my secret formula for finding our activities. My kids interests are my inspiration! I add in a touch of creativity and sometimes something more structured from Pinterest. But, most of all I am inspired by fun! Where do you find inspiration for fun crafts and activities to do with the kids?